The remarkable feature of the present huqqa base is that each of the sixteen flutes that compose its body has a unique floral scroll. The great inventiveness of the piece is expressed is the varied and never repeated floral motifs, which include lotuses, irises, roses and many other flower types. This is a rare characteristic that sets this huqqa base apart as an example of originality in Bidri metalware. The earliest huqqa bases or water pipes date from the seventeenth century (Zebrowski), and have a globular shape. Used to smoke tobacco, a new habit at the time, they were brought into the Mughal court from the Deccan at the very beginning of the century. The present piece, an example from the seventeenth century, has a globular form with a short cylindrical ringed neck gently broadening at the mouth. The body is moulded with vertical fluting, each flute inlaid with floral scrolls and divided by narrow chevron bands. The shoulder has the shape of a flower, and the motif of its petals is repeated at the bottom of the base, as well as in the neck, which in turn is also decorated with ring mouldings, one with chevrons and the other with lotus petals. 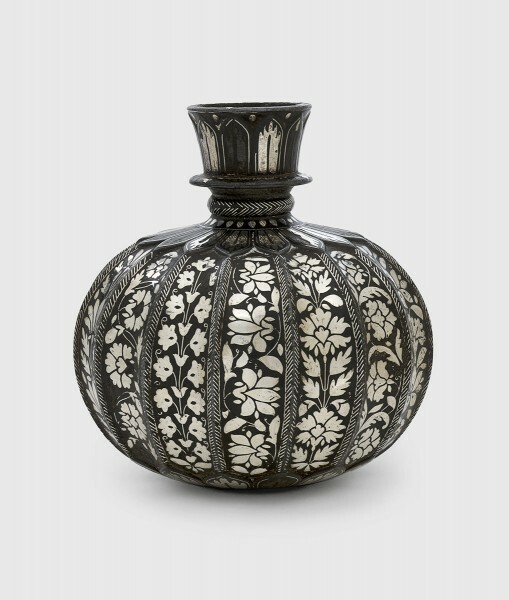 An example of a fluted Bidri huqqa base is in the collection of the Victoria and Albert Museum, from the William Tayler Collection (856-1874). In that piece, however, the floral decoration is repeated in the fluted body, unlike the present example. What both have in common is a smaller size, following the tendency in the late 17th century for extremely refined and elegant objects: smaller huqqas with less bulging shapes and narrower necks.